Domino's Pizza, Inc. (simply Domino's) is an American restaurant chain and international franchise pizza delivery corporation headquartered at the Domino Farms Office Park in Ann Arbor Charter Township, Michigan, United States. In 1997, Domino's opened its 1,500th international location, opening seven stores in one day across five continents. In this fast World, pizza is a rage … I had earlier posted on delivery of pizza for a BBC set designer on the train – not only within a limited time but at a Station where the train would halt for less than a minute – fortunate enough it was a two carriage train… speedy delivery is one of unique aspects to enhance sales… Often we hear about ‘drone’ - Unanned aerial vehicle (UAV)– remotely piloted aircrafts – which are controlled either autonomously or by onboard computers. They are usually deployed for military and special operation applications, but also used in a small but growing number of civil applications, such as policing and firefighting, and nonmilitary security work, such as surveillance of pipelines. In July 2014, Dodo Pizza in the northern Russian city of Syktyvkar posted a video online over the weekend showing the first airdrops of pizzas to customers and promised the service was not just a one-time PR stunt. It was pioneering effort of Russian Company taking 'pie in the sky' to a whole new level. In the video, a pizza agent in an orange vest dispatched to a local park is shown taking orders from a gaggle of hungry students. Moments later, a tiny copter hones into view and lowers a pizza to the customers on a piece of extending rope. By the speed and unique thought they took pizza and delivery to newer heights - now comes the news from Australia that a military robot that was designed to dodge bullets in the battlefield will now deliver pizza at doorstop. 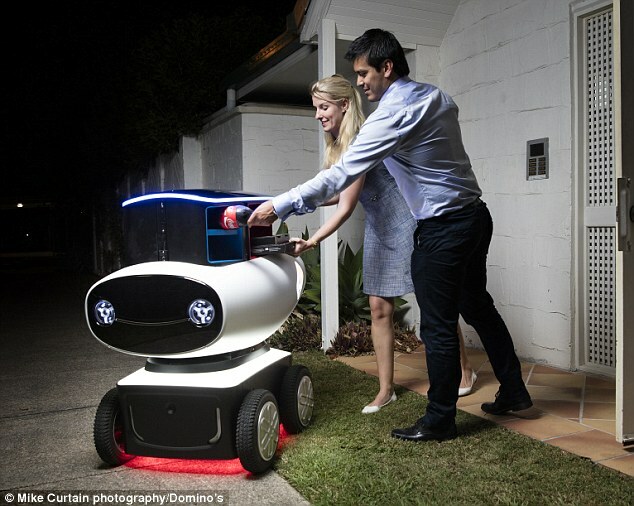 MailOnline writes that Domino's Australia has been working in a development lab with Australian start-up company Marathon Robotics for about six months to create DRU, the world's first autonomous delivery vehicle. The white, four-wheeled robotic unit can travel up to speeds of 20 kilometres and is able to navigate the streets independently, with a built in sensory system that uses lasers to can identify obstacles and calculate the best path to take. Inside DRU's sleek white exterior lies a temperature-controlled box designed to keep the pizza piping hot and drinks cold that rises up from inside the device to allow customers to collect their meal after imputing a unique code. 'It seems pretty crazy to us that one and a half - two tonne vehicles deliver a few hundred grams of pizza in the neighbourhood,' Domino's Group CEO and Managing Director Don Meij said. Mr Meij thinks traditional delivery methods are still 'quite an inefficient way for the future' but said there are still deliveries that DRU simply can not do. The Australian entrepreneur, who started out as a delivery driver himself, said the new system has the potential to reduce costs to the business like wages, but thinks its unlikely DRU's will be taking the jobs of young delivery drivers who make up a large percentage of the workforce. 'It pulls a lot of cost out of the business. Obviously labour is the number one cost; the whole management of our delivery fleet is expensive,' he said. The white, four-wheeled robotic unit can travel up to speeds of 20 kilometres and is able to navigate the streets independently, with a built in sensory system that uses lasers to can identify obstacles - it has rechargeable battery and DRU's power unit would be altered to give it more longevity in the future. 'But even when DRU hits the streets there will be people monitoring its performance. 'This will create jobs in Australia. As we move, jobs move. Consumers will have to meet the 190 kilogram robot out on the curb as he is not yet able to climb stairs or open doors, however the added effort will likely go unnoticed once they start engaging with DRU's 'cheeky' artificial intelligence. While he would not disclose how much money had been invested in developing the world first technology, Mr Meij said there would be sophisticated security cameras fitted to the device that will instantly transmit images to the cloud in case a drunken vandal tries to damage the expensive robot. Mr Meij said DRU is 'technically' ready for deployment, but there are a number of hoops he will have to jump through before he is operating out of stores. The robotic unit has been on several live trial runs but he still needs to pass a number of safety tests outlaid by various state and federal bodies that regulate the use of roads and footpaths, he is quoted as saying. The delivery vehicle is able to negotiate rocky, sandy or muddy terrain but he will remain on footpaths and bike trails until Domino's and each state's roads and traffic authority are able to determine how DRU could safely utilise main roads without jeopardising the safety of pedestrians, cyclists or other drivers. The announcement of Domino's newest 'team member' was made in front of 11,000 franchisees at the company's annual gala dinner on Thursday night . It is yet to be determined whether franchisees will rent or purchase the devices to be used in store, but as they will need to be continually maintained it is likely Domino's will own the androids.